FHT Stoves has strong Intellectual Property and product 'know how'. 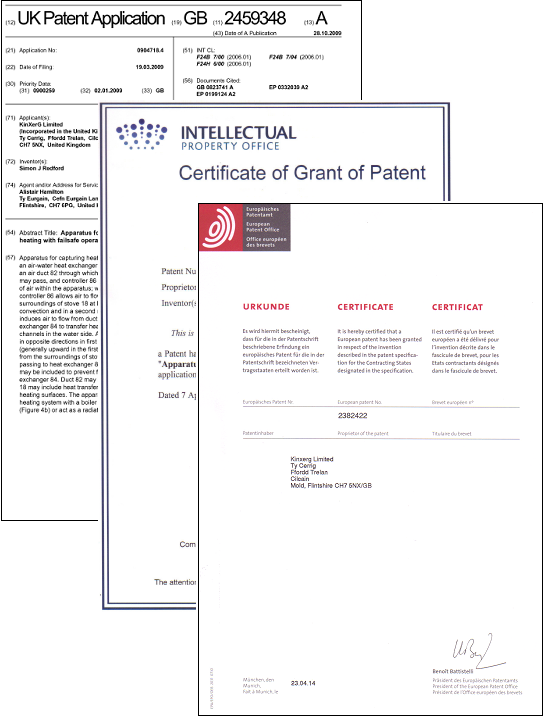 The relatively simple, robust concept is patented in many countries across Europe and also in New Zealand and Canada. A further application is being pursued in the US. Patenting is matched by solid Engineering development and testing, resulting in unique 'know how' to ensure safe, efficient and quiet operation and realistic production costs. The FHT Stove technology has been tried on various standard convector stove designs, demonstrating how easily they can be converted to take the FHT Stove components and offer all of the benefits of the technology. European patents can be found in national patent offices via searches on the European grant number EP2382422 or Application Number 10701038.1 The Canadian patent number is CA 2749249 and the New Zealand number is NZ 594197. Click on the image below to go to the European Patent Register or see individual Patent Offices in the list under the image.